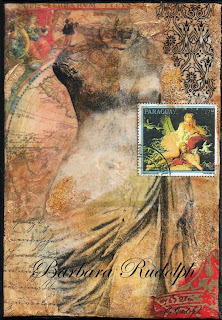 Barbara Rudolph Fine Art: Travel Journal "Torso of Aphrodite"
Here is one of my new "Travel Journals" on 7"x 5" gallery wrapped canvas. The edges are painted black and it features "The Torso of Aphrodite" with a beautiful postage stamp from Paraguay. My interest in stamps started with a few binders of gorgeous stamps that my grandfather had. He was a stamp collector. A few of the binders of stamps were tucked away in storage for many years after his passing, and were never really discovered until my adult life. I always thought they were interesing and many were quite beautiful. I started to collect them from my own travels and over the years started to incorporate them into some of my paintings. I now have a few collectors and friends that mail me interesting stamps to use in my artwork. It is always fun to create a memory for someone and to place one of the beautiful stamps into the piece. These make wonderful gifts.